Announcement PIN OUR LISTINGS TO SAVE! 2. Click on the "Contact the shop owner" link on the right and send us a link to your pins. 3. We'll send you a 10% off coupon that can be used on any order from our shop. 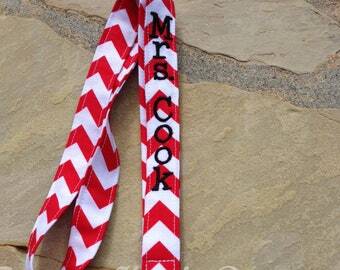 Specializing in monogrammed keychains, sports tags, and personalized ID lanyards. CURRENT PROCESSING TIME allow 3-7 BUSINESS days for us to create your custom order. BUSINESS Days do not include the weekend. We then ship USPS First Class with a tracking number. All of our products are customized by you to make it personalized, unique and one of a kind. We offer a large selection of fabrics to choose from to appeal to a wide rage of styles. Buying hand made makes it just that much more special. CANADA, UK, Australia : Your order can take up to 2 week for shipping after we process your order, so please just keep that in mind when ordering. From somewhere else? Convo us about shipping outside the US. We will be happy give you a shipping quote. Pricing on Bulk orders are determined on quantities ordered and packaging preferences. Please convo us for quotes on your special requests. Processing time will also be estimated per quote. Please keep in mind we are not a wholesaler. We make every item by hand so you are paying for our craftmanship. *Thanks for stopping by and please come again soon!! Beautifully made to my specifications. Oh my goodness!!! These are seriously the Best!!! Thank you so so SO much!!! 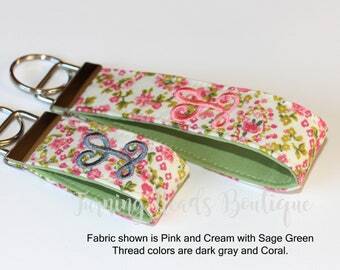 Love this floral fabric. Great keychain for the Spring. Testing a new font for the shop! I think I love it! ️ What do you think? 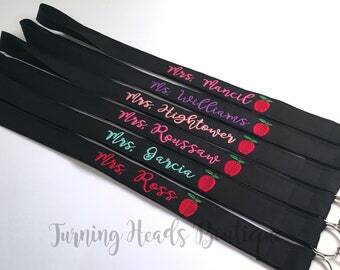 Such a fun gift idea for teachers. Love the monochromatic color scheme of this one! Step 1: Pick out fabric. Step 2: Pick out thread. Step: 3 Enter name in embroidery program. Step 4: Stitch out the name and sew it up. Step: Ready to ship out. Coming up with my Shop name was sooo fun! I wanted to create a name that represented both my story and what Iwant to do! Born as an Identical twin, growing up and even now as adults when with my twin sister we attract attention when we are together. People will actually Turn Heads to make sure they weren't just seeing double! Wanting to make items that are fun, functional and fashionable, it just CLICKED! Turning Heads Boutique. I love creating unique items that may catch someone's eye and turn their heads for a second look. As a former elementary teacher I loved the thought of creating something teachers could use that was cute, personalized and functional. I hope you enjoy looking around in my shop and feel free to ask me any questions you might have. Stay at home mom, who has a passion for creating personalized, practical products for others. 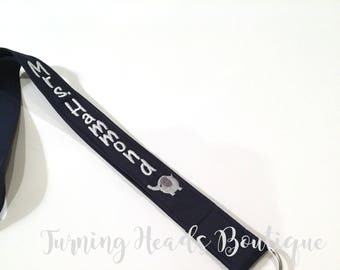 Every item in our shop is custom made. Based on the volume of orders we receive our processing time varies from 3-8 business days. You can be assured that we work as quickly as we can to process your order. If you have a specific deadline please contact us before you buy to confirm if we can accommodate you.